If you are receiving this message, you are among the short list of represented staff who has yet to fill out their union membership card (also called a Local 21 “Gold Card”). We are at an exciting time in our Chapter’s history – Local 21 is at over 91% membership county-wide! If you are among the minority of represented staff that has not yet filled out a Local 21 membership card, we need your support and hope you will join us as members of Local 21 today. Your voice and your ideas about how to improve Contra Costa County employment matter to us. 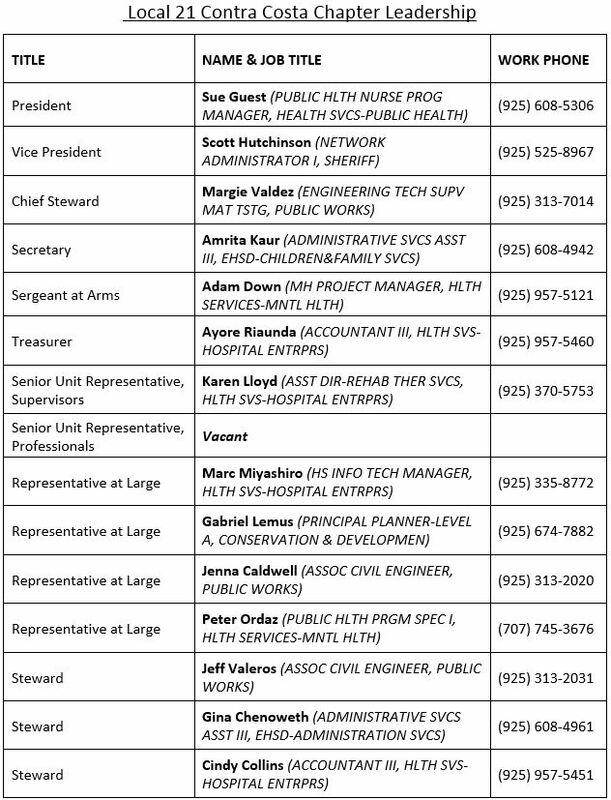 As the elected leaders of the Local 21 Contra Costa County Chapter, we are working hard to improve wages and make healthcare more affordable for Contra Costa County Local 21-represented employees, including you. We are stronger with you than we are without you. By adding your voice to our collective efforts, we can make Contra Costa County a better place to work for all Local 21-represented employees. Whether you have a favorable opinion of unions or not, or even if you had a negative experience with Local 21 or another union in the past, Local 21 is your organization. Local 21 belongs to you, and it is up to each represented employee to decide to make it stronger or not. We may not always agree on union goals, priorities, or strategies, but one thing we can all agree on is that if we unite to speak and act as one voice in our dealings with our employer, we can make Contra Costa County a better place to work. Local 21 staff and member leaders are working hard to make all Local 21-represented employees aware of a major threat posed to public employees by the Janus vs. AFSCME U.S. Supreme Court case. You can read about it here. As a result of these conversations, more non-members and fee-payers have joined as union members of Local 21 over the last three months than at any time in our Chapter’s history. We are uniting and building strength to help defend against the coming attacks on public employees’ wages and benefits. We are also trying to make real change in Contra Costa County, and we want you to be a part of this change. You can become a member of Local 21 by filling out the Union Membership Gold Cardonline today. If you want to learn more about Local 21 membership, what the Union is doing to prepare for 2019 wage and benefit contract negotiations with the County, or the anticipated attacks against public employees’ wages and benefits due to Janus vs. AFSCME, please don’t hesitate to contact any of us directly. We gladly volunteer our time to make sure all Local 21-represented employees will have a stronger voice in Contra Costa County. We hope you will join us.